Indulge your mind, soul, and body while soaking in a warm tub spiked with these natural, handmade Bath Soaks. Natural sea salts, known for their relaxing and rejuvenating properties, help to eliminate toxins. Baking soda naturally softens skin, while extracts of milk thistle and meadowsweet lend their antioxidant properties. 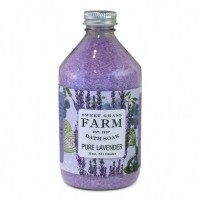 This Bath Soak is an essential addition to your inventory of natural skin care products.